This article was originally published on September 15, 2015 and has been updated to include current product information. Following each of the balloon glow performances at the Albuquerque International Balloon Fiesta, you will be treated to a spectacular (and I chose that word carefully, as it is one of the finest displays that I have seen) fireworks display over the northern section of Fiesta Park. 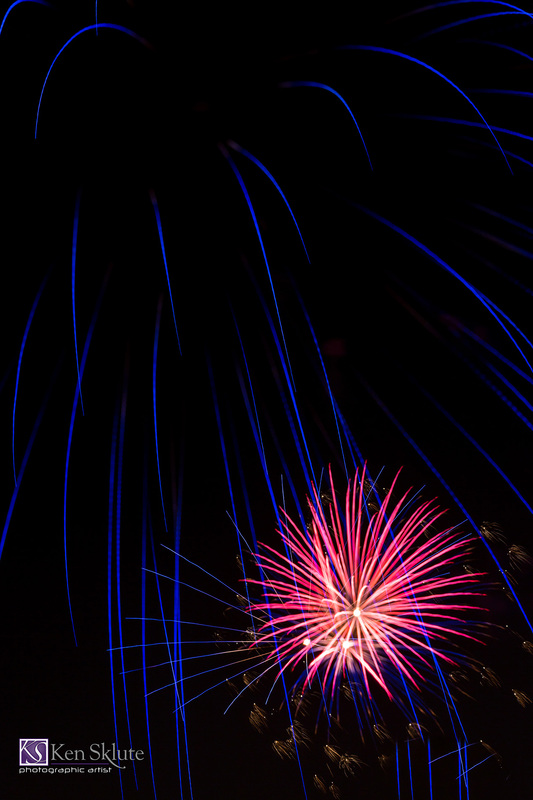 Your lens selection will vary depending where you are in the park when the fireworks begin. 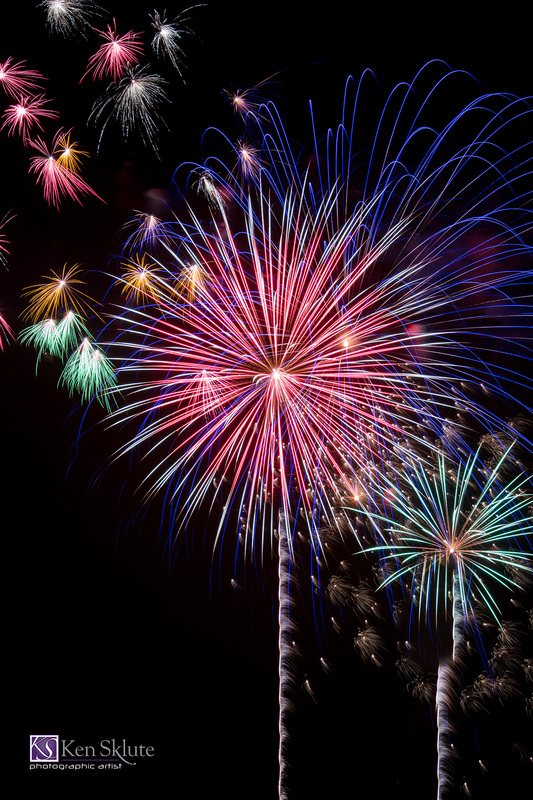 If you are near the southern end of the field, you will probably reach for a telephoto lens, like a 70-200mm or 70-300mm, to frame the fireworks without any of the light poles or balloon crews packing away the aircraft. If you are closer to the north end of the field, with a full-frame camera, a wide zoom like a 24-70mm or 24-105mm will again be the lens of choice. For this type of wide coverage with APS-C sensor cameras, anything from a standard 18-55mm (or even better, something like a 15-85mm) will give similar wide results. Plan on bringing a sturdy tripod that will hold your camera still during what may be an exposure of many seconds. Keep in mind that all tripods are not created equal. The weight of your camera and lens combination will dictate what tripod and head combination that you need to be using. 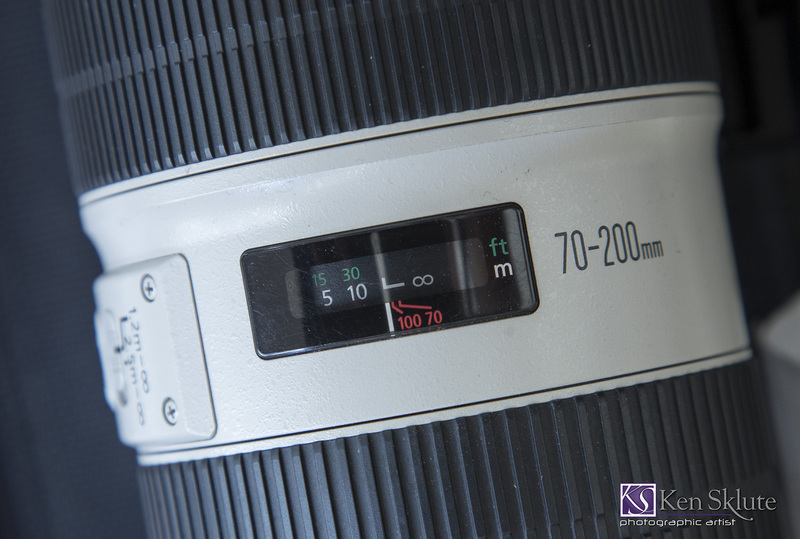 A super small, thin legged tripod may not be rated to hold your EOS 5D series body with an EF 70-200mm f/2.8L IS lens. You will need a way to release your shutter without touching your camera, so it prevents motion blur and camera shaking. Plan on bringing a cable release or intervalometer to attach to your camera body. A TC-80N3 is used by most of the Canon family of cameras. If your camera has a single-pin remote control socket, you can attach the three-pin TC-80N3 by using the optional Canon Remote Switch Adapter RA-E3 cord. An option for those who do not own a cable release is to use the two-second self-timer to fire the shutter. You can combine the self-timer with a 30 second exposure, along with the hat technique (explained below) to control your exposure length. Remember that many recent Canon cameras have built-in Wi-Fi ®, and you can use a compatible smartphone or tablet (connected via the Canon Camera Connect app, installed on your device) to fire your shutter. I place my camera mode on “B” for Bulb and select an aperture of f/11 or f/16 at ISO 100. I use one of the first bursts as a test to determine which f/stop will work best. I suggest setting your white balance to “Tungsten,” which will show the most brilliant colors of the burst. After I have determined where the burst will take place, I fine tune my composition and get ready to create some beautiful imagery. When photographing fireworks displays, one very important tool is a black baseball hat. I use this hat to cover the lens during specific times of the fireworks being launched into the sky. Why a baseball hat? Let’s start with the premise that in any photograph, there are good elements and there may be distracting elements that take your viewer’s attention away from the color and beauty you want them to focus on. Such is the case with fireworks. I look to remove as many distracting elements from my photographs in the capture stage (as best I can). Some things can be removed in post-production, but that can be time consuming or difficult – better to remove it in-camera! When the firework is launched from the ground, it has a bright propellant that will overpower the subtle colors and shape of the burst — I will explain how to avoid having that bright tail in your imagery. This is where the hat comes into play. As I watched the aerial mortars being fired, I opened my shutter on the camera while I held the black baseball hat in front of the lens, which effectively acted as a second shutter that I can control at will. 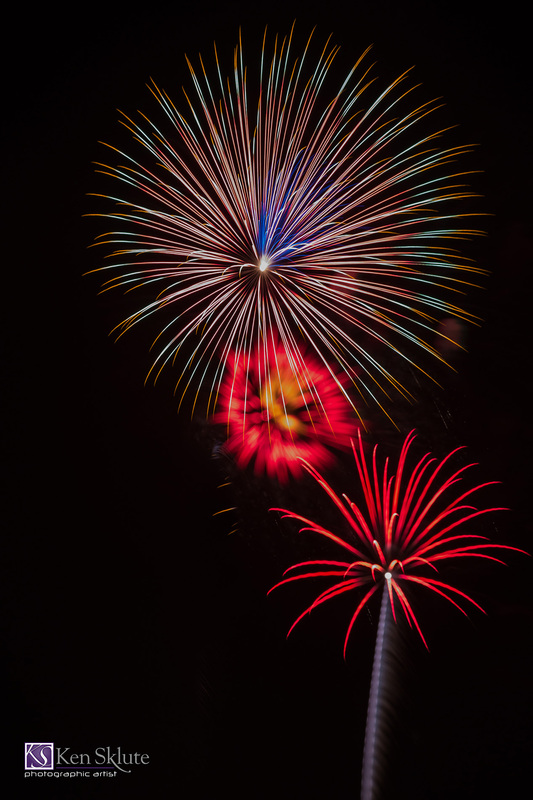 Be careful not to touch the camera with your hat, as it will cause the camera to move or create a vibration that will show up as movement in the fireworks image. I watched the propellant trail as the firework climbed high in the sky — and as soon as the burst began, I removed the hat from the front of the lens until the next charge was launched. Then, I replaced the hat in front of the lens until the next burst exploded. I usually collect around 10 bursts on a single frame, all without the white trails. The total time that the shutter stays open can be between 30 seconds to one minute. The use of the hat also prevents any ambient exposure building up and fogging your image. One of the most important considerations when photographing fireworks is to anticipate where in the sky where the fireworks will appear. I watch the first burst or two to get a feeling of that space so I can compose correctly. Then I change my composition during the show to be certain that all of the images do not look alike. In order to highlight the artistry and beauty of the pyrotechnics, I try to work against a black background, careful to eliminate any hint of the ground, light poles or anything other than the fireworks and the sky. This will take a bit of checking throughout the show to make sure that my camera is still aimed at the display area. One thing to be conscious of is the wind, which may alter where the bursts are in your frame. 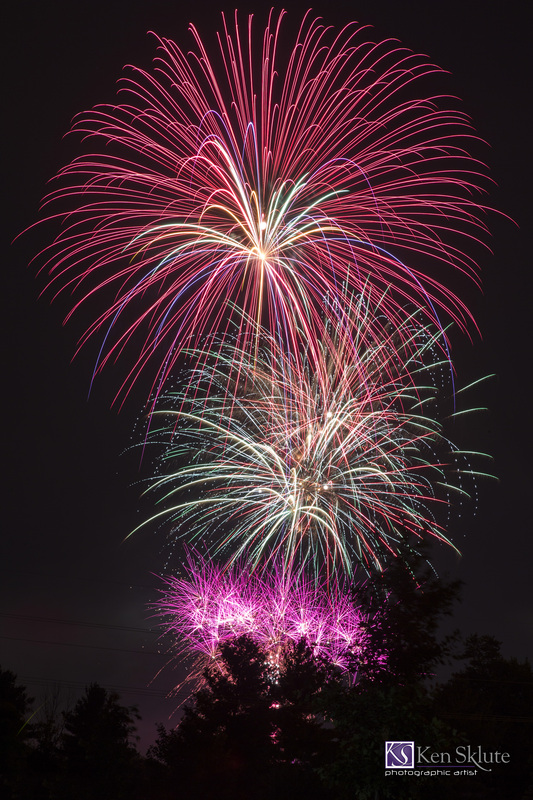 The fireworks are often staggered by height, so I usually compose my exposures in a vertical frame. Compositional variety will provide you with many unique arrangements, creating a diverse collection of imagery. Returning from a night of capturing sharp images in the dark takes a bit of understanding. How do you focus on something that you cannot see? This problem plagues many people when working in the dark. This is a technique that I employ most often: looking down on the top of your lens, you will find the infinity symbol at the end of your focus scale. Just to the left of that infinity symbol is a white line that looks like an L on its side. That is the Infinity Index. Align the vertical line of the infinity index with your focus index and you will be focused sharply at infinity. Another favorite way of focusing at night is to use Live View.Activate the Live View function and use the image magnifier to zoom in to an area that has some light, and you can now focus accurately. Using the Live View method of focusing will be a great help for those lenses that do not have a focus scale or infinity index available. 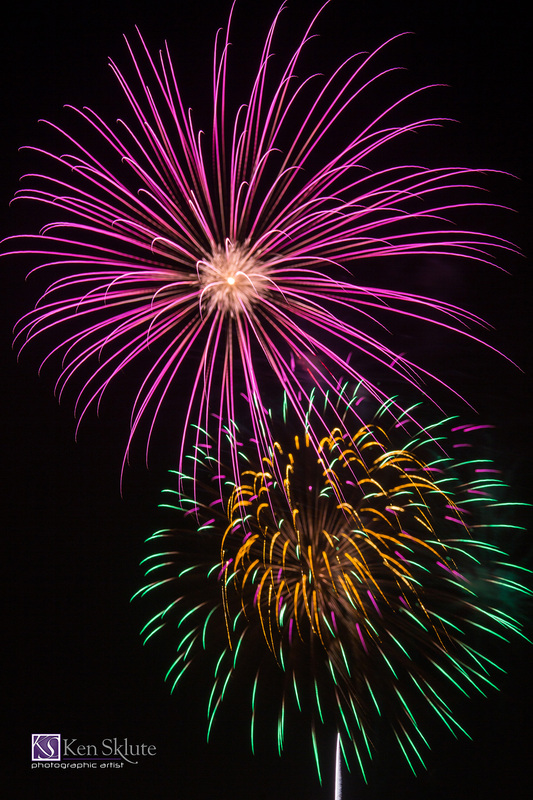 I tend to select a zoom lens for fireworks so I can continually tune my compositions. There will be times when I make a series of exposures at one focal length, followed by zooming the lens either in or out, creating a different size burst at a different focal length – all in one image. 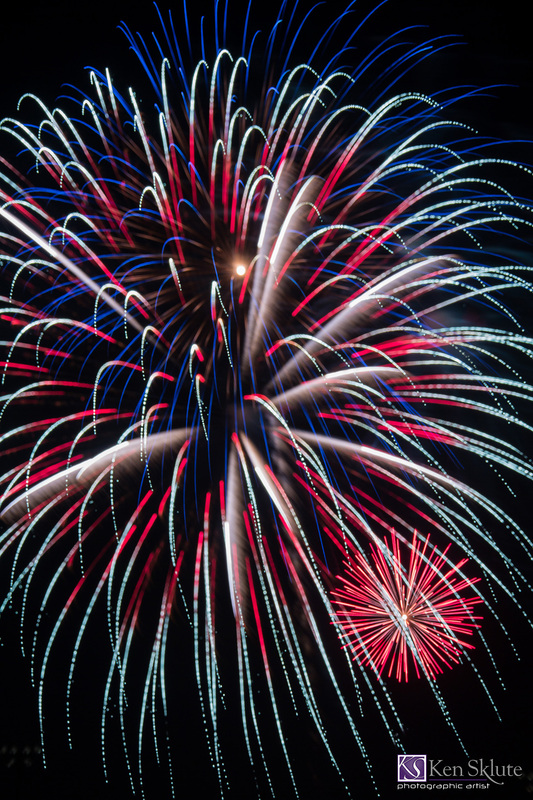 Once you master the challenge of properly focusing your fireworks, try the opposite effect: Slowly and gently change the point of focus by rotating the focus ring on the lens during the long exposure. This will produce a unique and artful depth and dimension to your images. I hope that you find success with this and all of the other fun techniques in photographing fireworks at the Canon Albuquerque International Balloon Fiesta. In our next article, get a balloon's eye view of photographing from above.